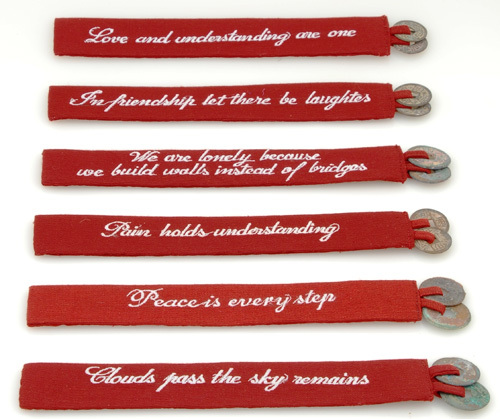 Item code: M01Price: $2Description: This bookmark is made from traditional Vietnamese raw silk with two dangling coins and a hand embroidered message. This could be a very meaningful and affordable gift for someone special. Comes in red or orange. All net proceeds from the sale of this item help fund heart surgeries to poor children in Vietnam through OGCDC (Office of Genetic Counseling for Disabled Children) at Hue University of Medicine and Pharmacy, Hue, Vietnam. Please note: The price is not included the shipping cost. 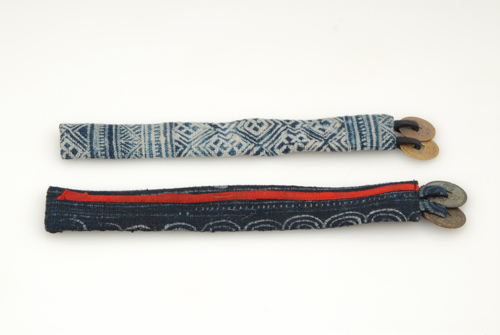 Item code: M02Price: $2Description: This bookmark is made from traditional Vietnamese batik fabric with two coins attached at one end. This could be a very meaningful and affordable gift for someone special. All net proceeds from the sale of this item returns to The SPIRAL Foundation and Office of Genetic Counseling and Disabled Children (OGCDC) to fund medical aid in Vietnam. Please note: The price is not included the shipping cost.